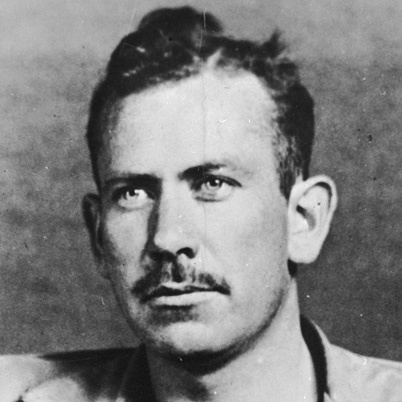 John Steinbeck (1902 – 1968) was an American writer best known for his novels about the social consequences of the Great Depression in America. His most famous works include Of Mice and Men (1937), The Grapes of Wrath (1939) and East of Eden (1952). He was awarded the Nobel Prize for Literature in 1962. John Steinbeck was born on 27th February 1902 in Salinas, California. His family were descendants of German immigrants and lived in a small rural town. Steinbeck had a comfortable but modest upbringing. In the summer, he spent his time working on the nearby ranches to help with the harvest and earn money. His work on the farms gave him an insight into the life of migrant workers, and his experiences would later provide material for his greatest works. Steinbeck studied at Salinas High school, and then went to Stanford University in Palo Alto. Despite staying there for five years, he left without a degree. In 1925, he left university and sought to establish himself as a writer in New York. However, he was unable to make a career for himself and he was forced to support himself doing odd jobs. In 1928, discouraged, Steinbeck returned to California where he got a job as a caretaker in Tahoe city. Despite working full time, in 1929, he was able to get his first novel, Cup of Gold, published. However, after a few years, Steinbeck received some financial support from his father, this allowed him to give up his full-time job. Steinbeck was able to devote more time to writing from his father’s cottage in Pacific Grove, Monterey, California. He also married Carol Henning in 1930. In 1935, the novel ‘Tortilla Flat‘ was published to critical acclaim. The novel was set in Monterey after World War One and portrays a bunch of homeless and classless men who reject the social mores of society. This novel was his first major breakthrough and gave him the financial income and confidence to pursue writing other novels. This period led to some of his most productive writing years. In particular, his short book ‘Of Mice and Men‘ (1939)and the epic novel – The Grapes of Wrath (1939) established his reputation as one of the pre-eminent modern American writers. Of Mice and Men was a short story about two migrant workers, George Milton and the mentally retarded Lennie Small who seek employment during the Great Depression. The Grapes of Wrath is a deeper discussion of the social, economic and cultural implications of the Great Depression. It focuses on a family of poor tenant farmers and their difficulties during the Great Depression; it offers a sympathetic account of migrant workers and is critical of capitalism. The Grapes of Wrath became the best selling book of 1939, and it led to Steinbeck being awarded the Pulitzer Prize for fiction. Both books captured the despair and personal cost of the Great Depression, and have become a classic literary account of this period. As well as the social implications, Steinbeck also captured a poignant reference to a mystical element of American farming land. The tragedy of the Great Depression heightened the missed opportunities to enable the American dream of cultivating the most fertile soil of the country. Steinbeck’s subtle political commentary was also controversial. The book, The Grapes of Wrath, was banned by the Kern County board of supervisors from 1939-41. Steinbeck was an active supporter of the FDR’s Liberal New Deal and had strong contacts with left-wing writers and labour union figures. In 1967, he went to Vietnam and wrote strongly in support of the war, which many felt was compromising his earlier liberal ideas. Steinbeck complained of government harassment because of his political views, arguing J. Edgar Hoover of the FBI encouraged the tax authorities to harass him. In 1942, he divorced his first wife and remarried, Gwendolyn Conger, they had one child – John Steinbeck IV. 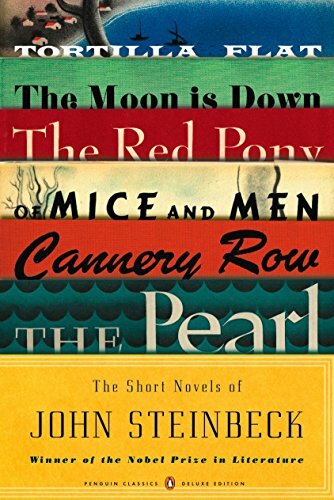 During the Second World War, Steinbeck wrote a novel inspired by the spirit of resistance to German occupation – The Moon is Down (1942). He also served as a war correspondent; he saw action in the Mediterranean and North Africa. In 1944, he was wounded after a munitions explosion and returned home. After the war, he visited the Soviet Union with renowned photographer, Robert Capa. He published his experiences in ‘A Russian Journal‘ it was a rare American insight into post-revolutionary Russia. In 1948, Steinbeck experienced a period of mental depression after a close friend, Ed Ricketts died in a motor accident, and his second wife insisted on divorce shortly after. Ricketts had encouraged much of Steinbeck’s writing during his most productive period in the late 1930s. In 1962, he was awarded the Nobel Prize for Literature. The Nobel Committee cited his great works Of Mice and Men, The Grapes of Wrath and a recent novel ‘The Winter of Our Discontent‘. Steinbeck was typically modest, questioning whether he really deserved it. After 1962, he didn’t write any more novels until his death in 1968. Citation: Pettinger, Tejvan. “Biography of John Steinbeck“, Oxford, UK www.biographyonline.net, 22 January 2013. Last updated 8 February 2018.